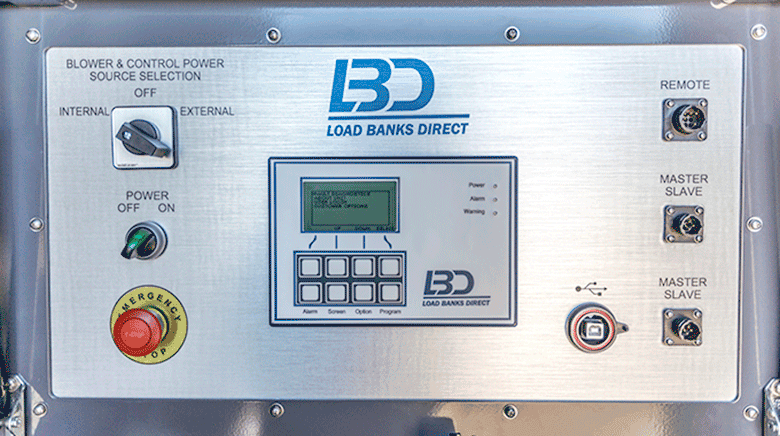 ERLANGER, KY, November 24, 2015 - Load Banks Direct (“LBD”) is a leading manufacturer of high-capacity Load Banks used in the testing and commissioning of standby emergency power systems including generators, uninterruptible power supplies, turbines, battery systems and other load applications. Today LBD announces the availability of an advanced digital operator control system known as Series One. This innovative new controller is microprocessor based and optimized for fast and accurate load testing. Master / Slave Capability – control up to 16 load banks with a single controller. Master controller auto-senses the total KW available for the entire connected fleet. Automatic Voltage Correction - the Controller evaluates the load voltage and scales the applied load for enhanced accuracy. Auto Step Control - easily program and launch an automatic load test with up to 10 individual KW steps and corresponding time intervals. Load Servo Mode - the Controller will intelligently monitor the entire load test and automatically make adjustments to keep the desired load KW within a defined range. Optional Remote Controller - can be connected and positioned up to 5000 feet from test area over a single RS-485 cable. Fault Diagnostics - will identify over 15 fault conditions to assist the operator when troubleshooting issues. Automatic Blower - start and stop with voltage and phase rotation correction. Field Upgradeable Firmware - allows you to stay current with the latest control advancements. LBD offers a comprehensive line of standard and custom-engineered load-testing solutions for mission-critical power systems. The Series One is now available on our entire line of load bank products. Due to exceptional growth during the past few years, we are pleased to announce that Load Banks Direct, LLC has moved to a newer and larger facility located in Erlanger, Kentucky. Load Banks Direct LLC (LBD) is a leading manufacturer of high-capacity Load Banks used in the testing and commissioning of standby emergency power systems including generators, uninterruptible power supplies, turbines, battery systems and regenerative power absorption of large motors, and other load applications. We offer a comprehensive line of UL listed, standard and custom-engineered load-testing solutions for mission-critical power systems. LBD, formerly a division of Powerohm Resistors (America’s largest manufacturer of power resistor products), has been manufacturing power resistors and load banks since 1996. However, in the past few years, we have been fortunate to achieve record sales growth with our load bank products which in-turn accelerated the need for a new, larger facility. Customer response to our product innovations and our company growth has been absolutely fantastic. 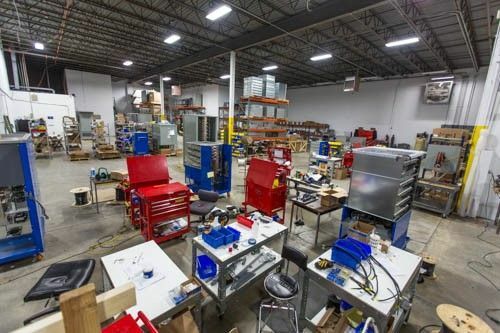 Located just minutes from the Cincinnati/Northern Kentucky International Airport and major interstate highways (I-275, I-75 and I-71), the new plant is ideally located and within a 500 mile radius of 50% of the entire US population. We also hope the convenience of this location will encourage new and existing customers to visit our plant in person to see our product quality and stock load banks first hand.